Lung cancer is a type of disease that starts in the small tissue of the lung. In many cases, it begins by forming in cells that are lining a person’s air passages. Lung cancer comes in two different forms known as small and non-small cell. In order to diagnose the type of cancer, doctors have to look at the cells under a microscope. Lung cancer is the primary cause of death among patients who have cancer, for both women and men. With that stated, however, it is also one of the most avoidable types of cancer. Most cases of the disease are linked to smoking. In fact, approximately 90% of lung cancer happens as a result of tobacco use. Lung cancer can even form from passive smoke. It is estimated that 3,000 people die each year in the United States due to secondhand smoke. Besides tobacco, there are other lung cancer causes. For instance, air pollution has been known to play a role in the disease. The air pollution risk is similar to that of passive smoking. Lung cancer can also develop from exposure to asbestos fibers and radon gas. Scientists also suspect that genetics may play a role in the disease. Most people do not have lung cancer symptoms until the disease has progressed. Many patients are unintentionally diagnosed. This commonly happens when a chest x-ray is done for another medical reason. When people do experience symptoms, they are direct effects of the primary tumor. Based on lung cancer studies, the symptoms can also occur from malignant disturbances in the blood or hormones. Some of the most common lung cancer symptoms are coughing, chest pain and shortness of breath. A new cough in smokers and former smokers should raise some concerns. In this instance, it would be best to have a doctor perform a series of tests. People should also visit the doctor if they develop a cough that will not go away–especially important if their cough gets worse over time. Patients who have lung cancer regularly cough up blood. Therefore, coughing up blood is another lung cancer symptom that should cause alarm. Some lung cancer patients don’t get chest pains. The ones that do describe it as a dull and aching pain that never seems to go away. Shortness of breath is another common symptom because it occurs when there is a blockage in the lung. The treatment for lung cancer depends on whether it is a small cell or a non-small cell. Each type of lung cancer is treated differently. There are a number of factors that doctors consider when creating a treatment regimen, so they will look at the overall health of the person, as well as the stage of the cancer. The most common lung cancer treatments are surgery, chemotherapy, and radiation therapy. During surgery, the surgeon removes the cancerous part of the lung. However, the surgeon also has to remove a margin of healthy tissue. Some patients have to go through another form of surgery called pneumonectomy, which a procedure where an entire lung is removed. Lung surgery carries some serious risks. 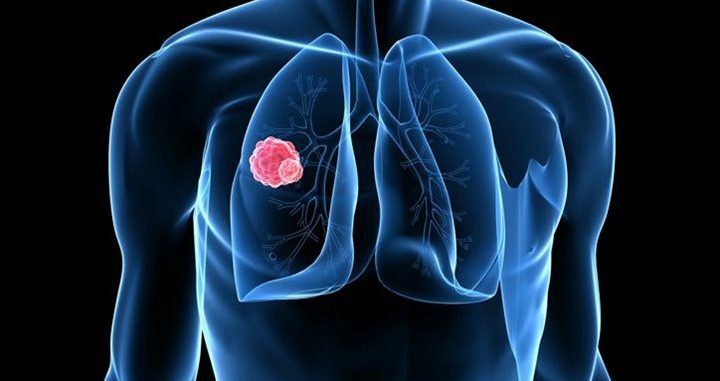 For that reason, it is not always the best option for lung cancer treatment. Chemotherapy is used to treat non-small cell lung cancer. In order to do this, drugs are administered intravenously, or they can also be taken orally. Chemotherapy is usually used as the first line of treatment. Treatment cycles typically last about a month and can be physically demanding, so this approach is generally not recommended for patients who are in particularly poor health. When radiation therapy is performed, the doctors use high-powered energy beams. These beams are meant to kill the cancer cells. Radiation therapy is often used in conjunction with chemotherapy—especially if doctors cannot operate to remove the tumor.